It was my daughter Laura’s idea. She called on Face Time and asked me what I was doing. 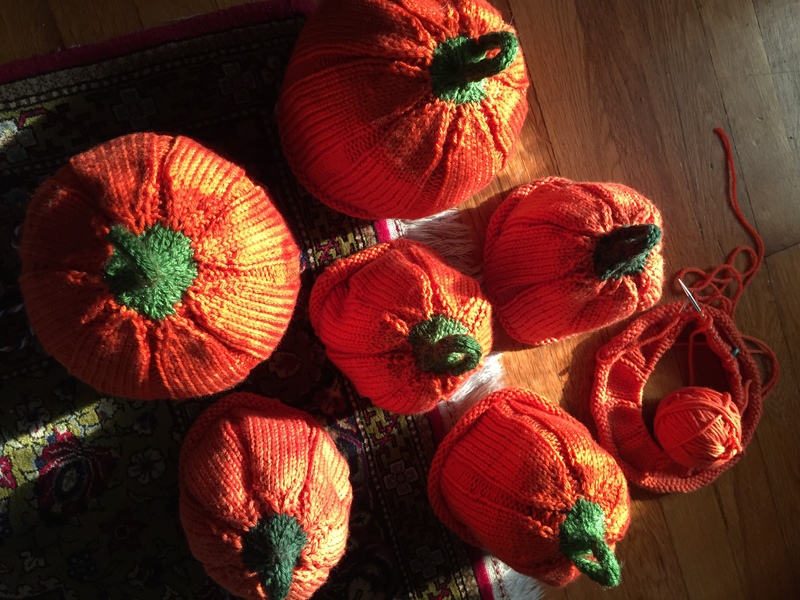 I showed her the little stack of different size pumpkins hats I knit this past week. 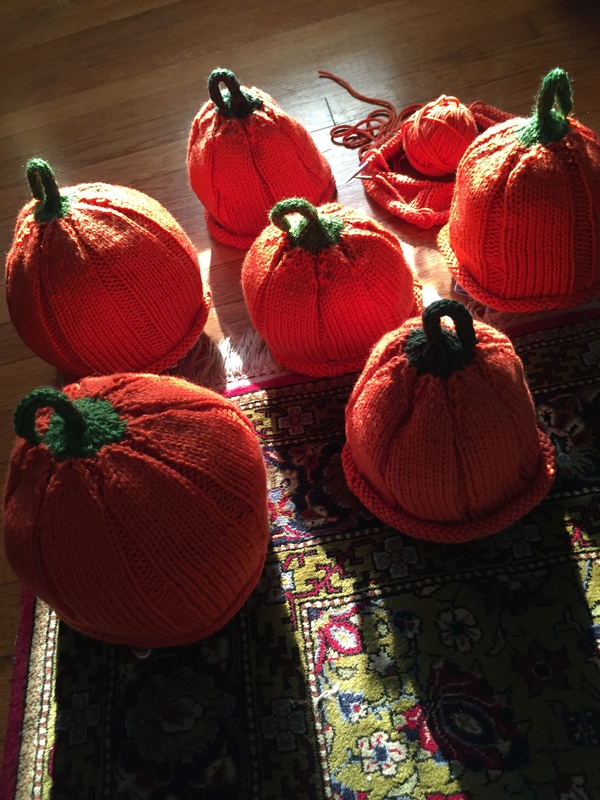 “Make a pumpkin patch with all the knitted pumpkin hats.” she said. “Stuff them with something to make them stand up.” Good idea, Laura. I was thinking about photographing outside in the grass but it is totally unfall-like with 85% humidity. The morning sun was streaming in through the lace curtains onto the living room floor. Not from every angle but the difference in lighting is remarkable. My first full week of retirement, no back to school. It’s a transition. And we’re moving from summer to fall, even though the heat is intense. Another transition. I bought a snow shovel this week. There’s still one hat on the needles. I’m knitting the last hat for my granddaughter Maura, who’s going to be 7 in November but said she’d wear one. I already gave one away a few days ago. 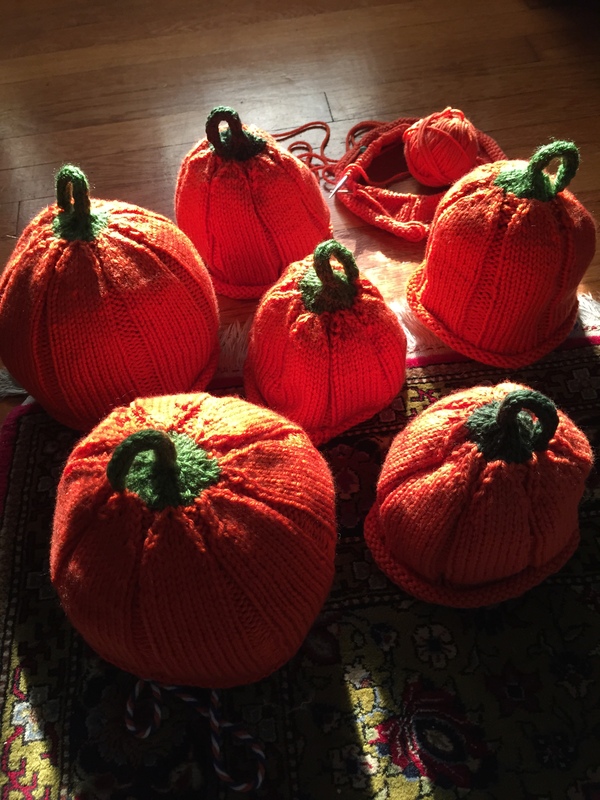 My other neighbor, J said the first pumpkin hat I posted looked like a tomato! 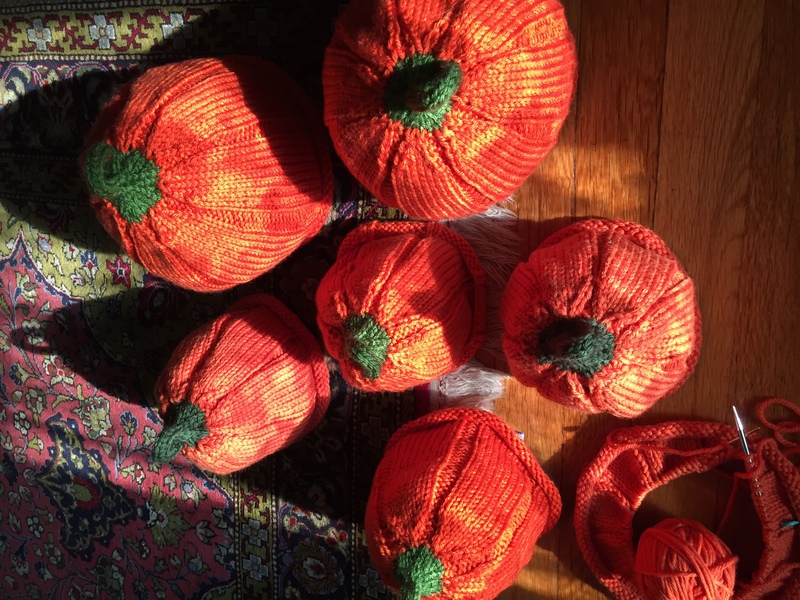 I think these photos show the color of yarn as orange for sure. Two hats and the one for Maura are Superwash Merino wool and the others are Premier Yarns Deborah Norville Soft Non-Pilling Acrylic. Hopefully easy wash and dry for the moms. The pattern was from Ravelry by Tara Thomsen in case you want to make some. Newborn to adult sizes. That’s enough for me this season. Portugal sounds lovely. I love autumn. It’s the long stretch of winter that looms. I love the different angles. The hats are so colorful. Don’t worry fall will come, that I am sure of. Such a pretty patch Ruth! Thanks Patti. No seeds to bake in the oven with bitter and salt, though. Such a sweet pumpkin patch! Good idea! Happy retirement!! They’re lovely, I don’t know how you’ve done so many so quickly! I love the hats. They are cute. You have spurred me on to get out my knitting needles! You could start a new carreer , in case retirement isn’t agreeing with you! Right!!! Enjoy your breakfast with The Today’s Show , Matt n Al rather than doing breakfast duty!! How clever. Well done. Thanks for the smile. Thanks Jamie for your visits, likes, and good words today! A lovely patch of very cute hats! Laura was smart to advise you to create this scene; very cute. The weather here has been insane as well: high 80s and tons of humidity have led to lots of head advisories with the heat index approaching the high 90s. I’m VERY grateful for air conditioning. We’re supposed to begin experiencing fall weather starting tomorrow.